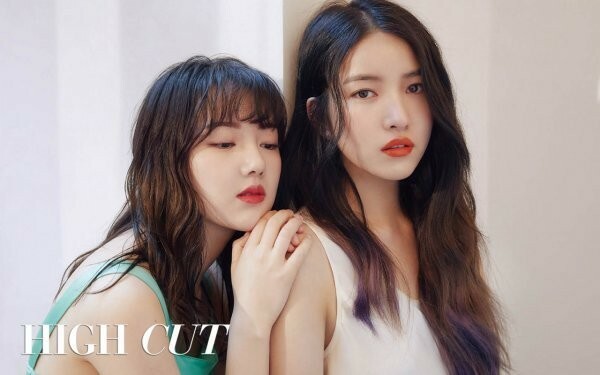 G-Friend�posed for the May issue of 'High Cut'. The girls went for warm, spring-themed makeup with a ton of blush. During the photoshoot,�Yuju�and Umji�talked about their own tips on makeup, and gave advice to fans who had questions through the 'High Cut' SNS account. Yuju said, "For pink-toned eye makeup, you should choose toned-down shades, and use 2-3 shadows that have different textures to give the eye some depth." Umji advised, "During schedules, the makeup on our skin breaks down. When that happens, layer foundation, a translucent powder, and then a mist in that order for long-lasting makeup."